In a small bowl, combine the yeast with the sugar and warm water and let stand until foamy, 5 minutes. In a medium saucepan, heat the milk with 10 tablespoons of the butter until just melted. Remove the saucepan from the heat and let cool slightly. Stir in the foamy yeast mixture. In the bowl of a standing electric mixer fitted with the dough hook, combine the flour with the kosher salt. With the machine on, gradually add the warm milk mixture and the eggs and beat at medium speed until a smooth, silky dough forms, about 10 minutes. Transfer the dough to a lightly oiled bowl, cover with plastic wrap and let rise until doubled in bulk, about 1 hour. Lightly butter a 9-by-13-inch metal baking pan. In a small saucepan, melt the remaining 6 tablespoons of butter over moderate heat. Punch down the dough and divide it into 24 pieces. Let the pieces rest for 5 minutes. Roll each piece of dough into a ball. Using buttered fingers, press the balls into 3-inch rounds. Brush all over with some of the melted butter and fold each one in half. 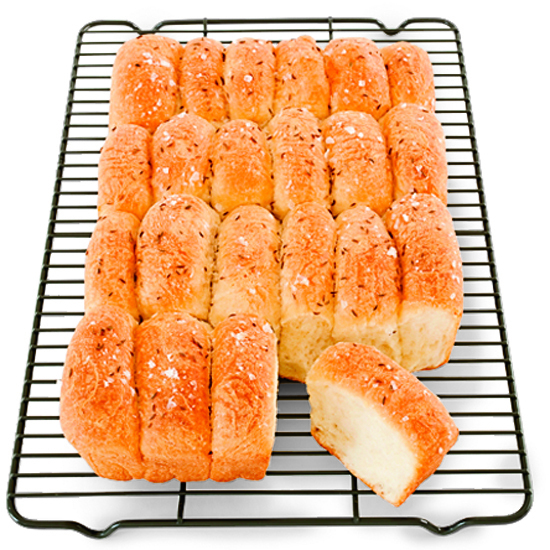 Arrange the rolls in the prepared pan, seams down, in even rows. Brush any remaining melted butter over the rolls. Cover loosely with plastic wrap and let rise until nearly doubled in bulk, about 1 hour. Preheat the oven to 350. Sprinkle the rolls with the caraway seeds and sea salt and bake in the center of the oven for 50 minutes, until puffy and golden. Transfer the pan to a rack and let cool for 15 minutes. Invert the rolls onto a platter, then invert them again onto the rack. Let cool slightly before serving. The rolls can be stored in an airtight container for up to 3 days at room temperature. Rewarm before serving.